“Big Brother Big Sister of Northwest Florida’s 2018 Gumbo Ya Ya will be held on Saturday, March 3 in Phineas Phogg’s at Seville Quarter! Amateur and professional teams will compete for bragging rights for the best gumbo in Pensacola. 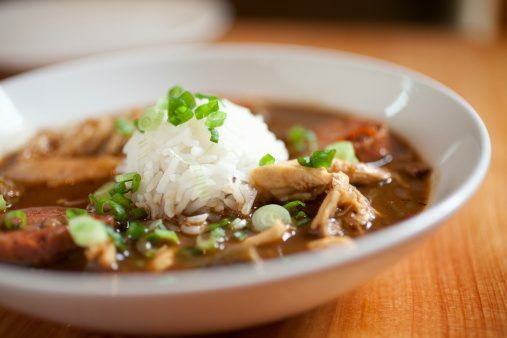 Each individual gumbo will be judged on taste, smell, color and consistency. Trophies will be awarded to the top three winners. In addition, there is a Showmanship trophy, given for best decoration and entertainment, and the coveted People’s Choice trophy! Entry to the competition is $20.00 per three-person team and is limited to 15 teams. Seville Quarter will supply tables, burners and a clean-up area. Each team must prepare their gumbo “from scratch” at Seville Quarter. Cooking begins at 11:00 a.m. and the judging begins at 4:00 p.m. The public tasting is from 4:00 to 6:00 p.m. and costs $10 at the door. Proceeds go to Big Brothers Big Sisters of Northwest Florida. Previous Previous post: Pet Adoption Event March 10th! Next Next post: Night Out Painting at Bel Aire Terrace!